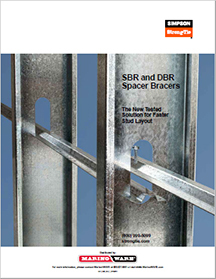 Marino\WARE is proud to stock SBR/43 and DBR/30 spacer bracers from Simpson Strong-Tie. These products reduce the installed cost of cold-formed steel stud walls by enabling faster stud layout while minimizing the need for bridging clips. The DBR is used for interior walls to eliminate stud bow and allow for quicker drywall attachment, while the SBR is designed for structural exterior walls. Both spacer bracers provide bracing along the length of the stud, and for head-of-wall slip conditions. The SBR and DBR also come with prepunched slots that eliminate the need to use bridging clips with on-module studs.